Ethylene propylene copolymers, substantially free of diene, are described. 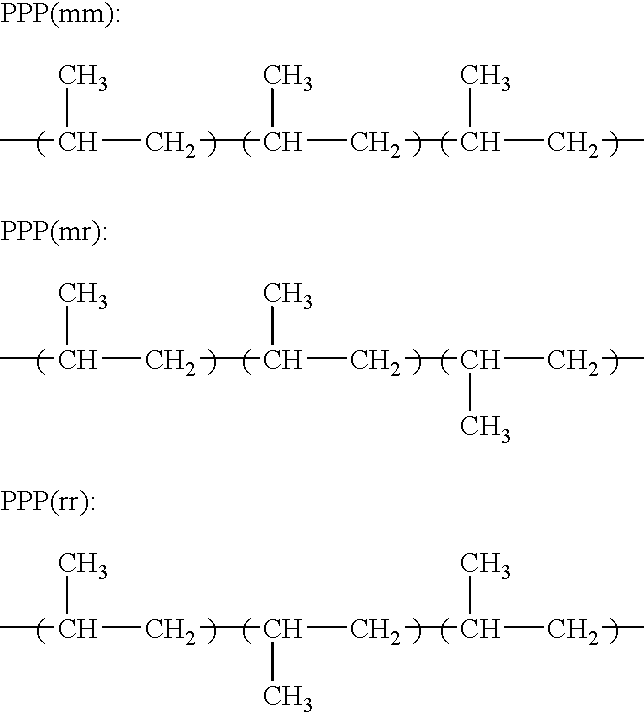 The copolymers will have a uniform distribution of both tacticity and comonomer between copolymer chains. Further, the copolymers will exhibit a statistically insignificant intramolecular difference of tacticity. The copolymers are made in the presence of a metallocene catalyst. In the journal articles  Science, Vol. 267, pp 217-219 (1995); Macromolecules, Vol. 31, pp 6908-6916 (1998); and Macromolecules, Vol. 32, pp 8283-8290, pp 3334-3340 and pp 8100-8106, propylene polymers with similar characteristics as those disclosed in the above discussed U.S. Pat. No. 5,747,621 are made and fractionated. The polymers are made with bis(aryl indenyl) or bisindenyl metallocene catalysts. In these journal articles, these polymers are fractionated in boiling ether and heptane, leaving a portion of the polymer insoluble in either. The polypropylenes are stated to be compositionally heterogeneous in terms of tacticity and molecular weight. (c) a proportion of inversely inserted propylene units based on the 2,1-insertion of a propylene monomer in all propylene insertions, as measured by  13C NMR, is not less than 0.5%, and a proportion of inversely inserted propylene units based on the 1,3-insertion of a propylene monomer, as measured by 13C NMR, is not more than 0.05%. EP 0 374 695 suggests ethylene-propylene copolymers and a process for preparing them. The copolymers have a reactivity ratio product, r 1r2, between 0.5 and 1.5 and an isotactic index greater than 0 percent. The copolymers are produced in the presence of a homogeneous chiral catalyst and an alumoxane co-catalyst. In another embodiment, the invention comprises a solution polymerization process for making the above described semicrystalline ethylene propylene copolymers by using particular catalyst and activator combination that lead to similar molecular weights and crystallinity from polymerization at a higher temperature or alternatively higher molecular weight and/or crystallinity when compared to polymerization processes conducted at a lower temperature using previous catalyst and activator combinations. This embodiment involves the use of bulky, non-coordinating activators in conjunction with single sited metallocene catalysts capable of making the polymers described above. In another aspect, this embodiment can additionally operate using a higher concentration of the monomers present in the polymerization reactor during polymerization. The combination of these two components of the invention leads to copolymers which have both a higher molecular weight as well as a higher level of tacticity of the propylene residues. Thus these bulky activator systems and higher monomer concentrations can be used for the polymerization of these copolymers at higher temperatures compared to the polymerization conducted with smaller anions while still generating copolymers which have similar molecular weights and isotactic propylene crystallinity. FIG. 1 is a plot of the natural log of crystalline intensity (by  1H NMR) versus time in milliseconds; T1ρ referred to in this description is the slope of the line. FIG. 6 is a plot of the Mooney (ML127C) as a function of propylene content in hexane solvent in weight percent and polymerization temperature for the copolymers of the current invention and comparative samples. where N i is the number of molecules having a molecular weight Mi. When n=0, M is the number average molecular weight Mn. When n=1, M is the weight average molecular weight Mw. When n=2, M is the Z-average molecular weight Mz. The desired MWD function (e.g., Mw/Mn or Mz/Mw) is the ratio of the corresponding M values. Measurement of M and MWD is well known in the art and is discussed in more detail in, for example, Slade, P. E. Ed., Polymer Molecular Weights Part II, Marcel Dekker, Inc., NY, (1975) 287-368; Rodriguez, F., Principles of Polymer Systems 3rd ed., Hemisphere Pub. Corp., NY, (1989) 155-160; U.S. Pat. No. 4,540,753; Verstrate et al., Macromolecules, vol. 21, (1988) 3360; and references cited therein. The tacticity index, expressed herein as “m/r”, is determined by  13C nuclear magnetic resonance (NMR). The tacticity index m/r is calculated as defined in H. N. Cheng, Macromolecules, 17, 1950 (1984). The designation “m” or “r” describes the stereochemistry of pairs of contiguous propylene groups, “m” referring to meso and “r” to racemic. An m/r ratio of 1.0 generally describes a syndiotactic polymer, and an m/r ratio of 2.0 an atactic material. An isotactic material theoretically may have a ratio approaching infinity, and many by-product atactic polymers have sufficient isotactic content to result in ratios of greater than 50. Copolymers of embodiments of our invention can have a tacticity index m/r ranging from a lower limit of 4 or 6 to an upper limit of 8 or 10 or 12. The  13C NMR spectrum of the propylene copolymer is measured as described in U.S. Pat. No. 5,504,172. The spectrum relating to the methyl carbon region (19-23 parts per million (ppm)) can be divided into a first region (21.2-21.9 ppm), a second region (20.3-21.0 ppm) and a third region (19.5-20.3 ppm). Each peak in the spectrum was assigned with reference to an article in the journal Polymer, Volume 30 (1989), page 1350. The propylene copolymers of embodiments of our invention have a triad tacticity of three propylene units, as measured by  13C NMR, of greater than 75%, or greater than 80%, or greater than 82%, or greater than 85%, or greater than 90%. The proportion of the 2,1-insertions to all of the propylene insertions in a propylene elastomer was calculated by the following formula with reference to article in the journal  Polymer, vol. 30 (1989), p.1350. Naming of the peaks in the above formula was made in accordance with a method by Carman, et al. in the journal  Rubber Chemistry and Technology, volume 44 (1971), page 781, where Iαδ denotes a peak area of the αδ+ secondary carbon peak. It is difficult to separate the peak area of Iαβ (structure (i)) from Iαβ (structure (ii)) because of overlapping of the peaks. Carbon peaks having the corresponding areas can be substituted therefor. The measurement of the 1,3 insertion requires the measurement of the βγ peak. Two structures can contribute to the βγ peak: (1) a 1,3 insertion of a propylene monomer; and (2) from a 2,1-insertion of a propylene monomer followed by two ethylene monomers. This peak is described as the 1.3 insertion peak and we use the procedure described in U.S. Pat. No. 5,504,172, which describes this βγ peak and understand it to represent a sequence of four methylene units. The proportion (%) of the amount of these errors was determined by dividing the area of the βγ peak (resonance in the vicinity of 27.4 ppm) by the sum of all the methyl group peaks and ½ of the area of the βγ peak, and then multiplying the resulting value by 100. If an α-olefin of three or more carbon atoms is polymerized using an olefin polymerization catalyst, a number of inversely inserted monomer units are present in the molecules of the resultant olefin polymer. In polyolefins prepared by polymerization of α-olefins of three or more carbon atoms in the presence of a chiral metallocene catalyst, 2,1-insertion or 1,3-insertion takes place in addition to the usual 1,2-insertion, such that inversely inserted units such as a 2,1-insertion or a 1,3-insertion are formed in the olefin polymer molecule (see,  Macromolecular Chemistry Rapid Communication, Volume 8, page 305 (1987), by K. Soga, T. Shiono, S. Takemura and W. Kaminski). The proportion of inversely inserted propylene units of embodiments of our invention, based on the 2,1-insertion of a propylene monomer in all propylene insertions, as measured by  13C NMR, is greater than 0.5%, or greater than 0.6%. The proportion of inversely inserted propylene units of embodiments of our invention, based on the 1,3-insertion of a propylene monomer, as measured by  13C NMR, is greater than 0.05%, or greater than 0.06%, or greater than 0.07%, or greater than 0.08%, or greater than 0.085 percent. The copolymer of embodiments of our invention has a statistically insignificant intermolecular difference of tacticity of polymerized propylene between different chains (intermolecularly.). This is determined by thermal fractionation by controlled dissolution generally in a single solvent, at a series of slowly elevated temperatures. A typical solvent is a saturated hydrocarbon such as hexane or heptane. These controlled dissolution procedures are commonly used to separate similar polymers of different crystallinity due to differences in isotactic propylene sequences, as shown in the article in  Macromolecules, Vol. 26, p2064 (1993). For the copolymers of embodiments of our invention where the tacticity of the propylene units determines the extent of crystallinity, we expected this fractionation procedure will separate the molecules according to tacticity of the incorporated propylene. This procedure is described below. One method to describe the molecular features of an ethylene-propylene copolymer is monomer sequence distribution. Starting with a polymer having a known average composition, the monomer sequence distribution can be determined using spectroscopic analysis. Carbon 13 nuclear magnetic resonance spectroscopy ( 13C NMR) can be used for this purpose, and can be used to establish diad and triad distribution via the integration of spectral peaks. (If 13C NMR is not used for this analysis, substantially lower r1r2 products are normally obtained.) The reactivity ratio product is described more fully in Textbook of Polymer Chemistry, F. W. Billmeyer, Jr., Interscience Publishers, New York, p.221 et seq. (1957). K 21 and K22 are kinetic insertion constants for propylene. As is known to those skilled in the art, a reactivity ratio product r 1r2 of 0 can define an “alternating” copolymer, and a reactivity ratio product of 1 is said to define a “statistically random” copolymer. In other words, a copolymer having a reactivity ratio product r1r2 of between 0.6 and 1.5 is generally said to be random (in strict theoretical terms, generally only a copolymer having a reactivity ratio product r1r2 greater than 1.5 contains relatively long homopolymer sequences and is said to be “blocky”). The copolymer of our invention will have a reactivity ratio product r1r2 of less than 1.5, or less than 1.3, or less than 1.0, or less than 0.8. The substantially uniform distribution of comonomer within polymer chains of embodiments of our invention generally precludes the possibility of significant amounts of propylene units or sequences within the polymer chain for the molecular weights (weight average) disclosed herein. The copolymer of embodiments of our invention has statistically insignificant intramolecular differences of tacticity, which is due to isotactic orientation of the propylene units along the segments of the same chain (intramolecular). This compositional analysis is inferred from the detailed analysis of the differential scanning calorimetry, electron microscopy and relaxation measurement (T 1ρ). In the presence of significant intramolecular differences in tacticity, we would form ‘stereoblock’ structures, where the number of isotactic propylene residues adjacent to one another is much greater than statistical. Further, the melting point of these polymers depends on the crystallinity, since the more blocky polymers should have a higher melting point as well as depressed solubility in room temperature solvents. The principle of solid state proton NMR relaxation time ( 1H NMR T1ρ) and its relationship with polymer morphology have been discussed in Macromolecules 32 (1999), 1611. The experimental T1ρ relaxation data of embodiments of the current invention, and polypropylene (PP) homopolymer (control sample) are shown in FIG. 1, which plots the natural log of the crystalline intensity versus time; the experimental procedure for collecting these data is described below. To fit the data with single exponential function, linear regression was performed on the ln(I) vs. t data, where I is the intensity of the crystalline signal. Then, the quality of the fit, R2, is calculated. The R2 for a perfect linear correlation is 1.0. The R2 for polypropylene (control) and a copolymer of the current invention (shown in FIG. 1) are 0.9945 and 0.9967, respectively. Therefore, the T1ρ relaxation for both polypropylene homopolymer and a copolymer of the current invention can be well fitted by a single-exponential. From the fit, the T1ρ of polypropylene and a copolymer of the present invention, are calculated as 25 milliseconds (ms) and 8.7 ms, respectively. The large difference in the T1ρ is reflective of their difference in morphology. The hypothetical polypropylene-like regions would have T 1ρ relaxation similar to that in polypropylene homopolymer. As a result, should such regions exist in embodiments of the invention, the T1ρ relaxation would contain a component that has a T1ρ relaxation time characteristic of polypropylene homopolymer (i.e., T1ρ=25 ms). As seen in FIG. 1, the T1ρ relaxation of the current invention can only be well fitted by a single exponential. Incorporation of a component whose T1ρ=25 ms would deteriorate the fit. This demonstrates that the polymers of the current invention do not contain long continuous isotactic propylene units. In embodiments of our invention, the T1ρ, relaxation time can be less than 18 ms, or less than 16 ms, or less than 14 ms, or less than 12 ms, or less than 10 ms. The experiments are performed on a Bruker DSX-500 Nuclear Magnetic Resonance (NMR) spectrometer, with a  1H frequency of 500.13 MHz and 13C frequency of 125.75 MHz. The pulse sequence was a 90° (1H) pulse followed by spin lock and cross polarization (“CP”; time=0.1 ms). A spin lock field strength of γB1=2π*60 kHz is used. After the spin lock, the magnetization is transferred to 13C by CP and then the signal is detected. The crystalline methine signal at 26.7 ppm is recorded and normalized and its natural logarithm (Ln) is plotted against spin lock time in FIG. 1. Measurements were made on a polypropylene homopolymer sample, and on a polymer of the present invention, labeled “Sample 4” and described in the Examples below. Table 1 presents the data. wherein Cp 1 and Cp2 are preferably the same; R1 and R2 are each, independently, a halogen or a hydrocarbyl, halocarbyl, hydrocarbyl-substituted organometalloid or halocarbyl-substituted organometalloid group containing up to 20 carbon atoms; m is preferably 1 to 5; p is preferably 1 to 5; preferably two R1 and/or R2 substituents on adjacent carbon atoms of the cyclopentadienyl ring associated therewith can be joined together to form a ring containing from 4 to 20 carbon atoms; R3 is a bridging group; n is the number of atoms in the direct chain between the two ligands and is preferably 1 to 8, most preferably 1 to 3; M is a transition metal having a valence of from 3 to 6, preferably from group 4, 5, or 6 of the periodic table of the elements, and is preferably in its highest oxidation state; each X is a non-cyclopentadienyl ligand and is, independently, a hydrocarbyl, oxyhydrocarbyl, halocarbyl, hydrocarbyl-substituted organometalloid, oxyhydrocarbyl-substituted organometalloid or halocarbyl-substituted organometalloid group containing up to 20 carbon atoms; and q is equal to the valence of M minus 2. A catalyst system of μ-(CH 3)2Si(indenyl)2Hf(CH3)2 with a cocatalyst of N,N-dimethylanilinium tetrakis(pentafluorophenyl)borate, can be used. In a preferred embodiment, the activating cocatalyst, precursor ionic compounds comprise anionic Group 13 element complexes having four halogenated aromatic ligands typically bulkier than substituted tetraphenyl boron compounds of the exemplified in the identified prior art. 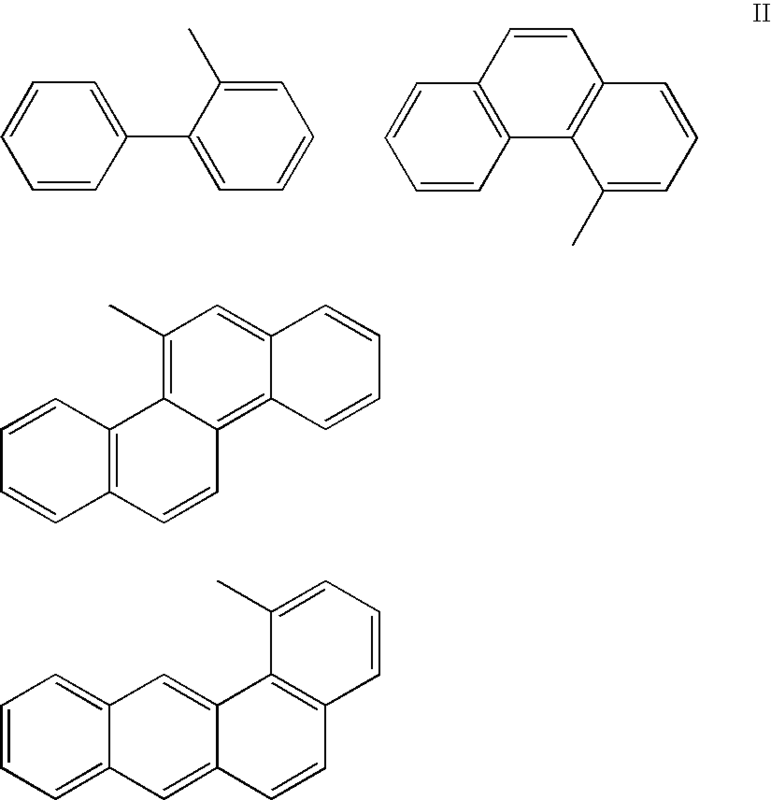 These invention aromatic ligands consist of polycyclic aromatic hydrocarbons and aromatic ring assemblies in which two or more rings (or fused ring systems) are joined directly to one another or together. These ligands, which may be the same or different, are covalently bonded directly to the metaumetalloid center. In a preferred embodiment the aryl groups of said halogenated tetraaryl Group 13 element anionic complex comprise at least one fused polycyclic aromatic hydrocarbon or pendant aromatic ring. Indenyl, napthyl, anthracyl, heptalenyl and biphenyl ligands are exemplary. The number of fused aromatic rings is unimportant so long as the ring junctions and especially the atom chosen as the point of connection to the Group 13 element center permit an essentially tetrahedral structure. Thus, for example, suitable ligands include those illustrated below, the open bond being to the Group 13 atom. See also the polycyclic compound examples in the literature for additional ligand selection, e.g.,  Nomenclature of Organic Compounds, Chs. 4-5 (ACS, 1974). Suitable cations for precursor compounds capable of providing the noncoordinating anions of the invention cocatalysts include those known in the art. Such include the nitrogen-containing cations such as those in U.S. Pat. No. 5,198,401, the carbenium, oxonium or sulfonium cations of U.S. Pat. No. 5,387,568, metal cations, e.g., Ag +, the silylium cations of WO 96/08519, and the hydrated salts of Group 1 or 2 metal cations of WO 97/22635. Each of the documents of this paragraph are incorporated by reference for purposes of U.S. patent practice. The cationic portion of activators according to this embodiment preferably has the form R 3PnH, wherein R represents an alkyl or aryl moiety; Pn represents a pnictide; N, P, or As; and H is hydrogen. Suitable R are shown below. This list does not limit the scope of the invention; any R that allows the cationic portion to function as described is within the scope of this invention. R includes, but is not limited to, methyl, phenyl, ethyl, propyl, butyl, hexyl, octyl, nonyl, 3-ethylnonyl, isopropyl, n-butyl, cyclohexyl, benzyl, trimethylsilyl, triethylsilyl, tri-n-propylsilyl, tri-isopropylsilyl, methylethylhexylsilyl, diethylnonlysilyl, triethylsilylpropyl, 2,2-dimethyloctyl, triethylsilylethyl, tri-n-propylsilylhexyl, tri-isopropylsilyloctyl, and methyldiethylsilyloctyl. The protocol for measuring the elasticity of the sample consists of prestretching the deformable zone of the dumbbell, made according to the procedure described above for the measurement of elongation and tensile strength, which is the narrow portion of the specimen, to 200% of its original length to prestretch the sample. This is conducted at a deformation rate of 10 inches (25 cm) per minute. The sample is relaxed at the same rate to form an analytical specimen which is a prestretched specimen of the original sample. This slightly oriented, or prestretched, sample is allowed to relax for 48 hours, at room temperature, prior to the determination of elasticity. The length of the deformation zone in the sample is measured to be d 1. After the 48 hours, it is again deformed at 10 inches per minute for a 200% extension of the deformation zone of the sample and allowed to relax at the same rate. The sample is removed and after 10 minutes of relaxation the sample is measured to have a new length of the deformation zone of d2. The elasticity of the sample as a percent is determined as 100*(d2−d1)/d1. where X is the ratio of the peak height at 1155 cm −1 to peak height at either 722 cm−1 or 732 cm−1, which ever is higher. Techniques for determining the molecular weight (Mn and Mw) and molecular weight distribution (MWD) are found in U.S. Pat. No. 4,540,753, and in  Macromolecules, 1988, volume 21, p. 3360 (Verstrate et al). Sample # 23° C. 31° C. 40° C.
Hexane, ethylene, and propylene were fed to the reactor at the rates shown in Tables 8 through 12. The polymerization catalyst, dimethyl silyl bridged bis-indenyl Hafnium dimethyl was activated in vitro with 1:1 molar ratio with NCA indicated below in the tables and introduced into the polymerization reactor at the rate of 0.0135 g/hr. Two NCA's were used: N′,N′-Dimethyl anilinium-tetrakis (pentafluorophenyl)borate (A1) and N,N′-Dimethyl anilinium-tetrakis (heptafluoro-1-napthyl)borate (A2). A dilute solution of triisobutyl aluminum was introduced into the reactor as a scavenger of catalyst terminators. A rate of approximately 1.11 mole of scavenger per mole of catalyst was adequate for this polymerization. After five residence times of steady polymerization, a representative sample of the polymer produced in this polymerization was collected. The solution of the polymer was withdrawn from the top, and then steam distilled to isolate the polymer. The polymerization rate was measured as shown in the tables below. The polymer produced in this polymerization was. analyzed for ethylene content by FT-IR, molecular weight averages by GPC. Crystallinity was measured by DSC and the amount of mm triads of propylene residues in the polymer chain was determined by  13C NMR. As we have mentioned above the crystallinity and mm triads determination are redundant determinations since the crystallinity of the polymers are dependent only on the isotactic propylene residues. # NCA Temp (° C.) (kg/hr) (g/hr) (g/hr) (kg/hr) wt % in C6 C2 wt % ML@127° C.
All patents, test procedures, and other documents cited in this application are fully incorporated by reference to the extent such disclosure is not inconsistent with this application and for all jurisdictions in which such incorporation is permitted. P=the steady state propylene concentration in the polymerization reaction zone in moles per liter. 2. The process of claim 1 wherein said propylene copolymer contains units derived from propylene in an amount of from 80 to 90 weight percent. 3. The process of claim 1 wherein said propylene copolymer contains units derived from ethylene in an amount of from 10 to 25 weight percent. 4. The process of claim 1 wherein said homogeneous polymerization conditions are adiabatically conducted in a continuous polymerization process. 5. The process of claim 4 wherein said homogeneous polymerization conditions are conducted in a continuous process at a pressure of at least 500 bar. 6. The process of claim 1 wherein the reaction temperature is in a range of 60° C. to 200° C.
7. The process of claim 1 wherein said propylene copolymer has a melting point of from less than 90° C. to greater than 40° C.
8. The process of claim 1 wherein said propylene copolymer has a heat of fusion of greater than 1.0 J/g to less than 75 J/g. 9. The process of claim 1 wherein said propylene copolymer has a heat of fusion of greater than 4.0 J/g to less than 30 J/g. 10. The process of claim 1 wherein said organometallic Group 4 transition metal compound comprises two cyclopentadienyl ligands covalently bridged by a substituted or unsubstituted carbon atom or a substituted or unsubstituted silicon atom, wherein said Group 4 transition metal compound is chiral. 11. The process of claim 10 wherein said Group 4 metal is hafnium. 12. The process of claim 10 wherein said bridge atom is substituted with at least one methyl group. 13. The process of claim 10 wherein said cyclopentadienyl ligands are indenyl. b) recovering a propylene copolymer containing units derived from propylene in an amount greater than or equal to 75 weight percent, and units derived from ethylene in an amount of from 5 to 25 weight percent, wherein the copolymer has a melting point of from greater than 35° C. to less than 110° C., and a traid tacticity of greater than 85%. 15. The process of claim 14 wherein said propylene copolymer contains units derived from propylene in an amount of from 80 to 90 weight percent. 16. The process of claim 14 wherein said propylene copolymer contains units derived from ethylene in an amount of from 10 to 25 weight percent. 17. The process of claim 14 wherein said homogeneous polymerization conditions are adiabatically conducted in a continuous polymerization process. 18. The process of claim 17 wherein said homogeneous polymerization conditions are conducted in a continuous process at a pressure of at least 500 bar. 19. The process of claim 14 wherein the reaction temperature is in a range of 60° C. to 200° C.
20. The process of claim 14 wherein said propylene copolymer has a melting point of from less than 90° C. to greater than 40° C.
21. The process of claim 14 wherein said propylene copolymer has a heat of fusion of greater than 1.0 J/g to less than 75 J/g. 22. The process of claim 14 wherein said propylene copolymer has a heat of fusion of greater than 4.0 J/g to less than 30 J/g. 23. The process of claim 14 wherein said propylene copolymer has a a traid tacticity of greater than 90%. 24. The process of claim 14 wherein said organometallic Group 4 transition metal compound comprises two cyclopentadienyl ligands covalently bridged by a substituted or unsubstituted carbon atom or a substituted or unsubstituted silicon atom, wherein said Group 4 transition metal compound is chiral. 25. The process of claim 24 wherein said Group 4 metal is hafnium. 26. The process of claim 24 wherein said bridge atom is substituted with at least one methyl group. 27. The process of claim 24 wherein said cyclopentadienyl ligands are indenyl. 29. The process of claim 28 wherein said propylene copolymer contains units derived from propylene in an amount of from 80 to 90 weight percent. 30. The process of claim 28 wherein said propylene copolymer contains units derived from ethylene in an amount of from 10 to 25 weight percent. 31. The process of claim 28 wherein said homogeneous polymerization conditions are adiabatically conducted in a continuous polymerization process. 32. The process of claim 31 wherein said homogeneous polymerization conditions are conducted in a continuous process at a pressure of at least 500 bar. 33. The process of claim 28 wherein the reaction temperature is in a range of 60° C. to 200° C.
34. The process of claim 28 wherein said propylene copolymer has a melting point of from less than 90° C. to greater than 40° C.
35. The process of claim 28 wherein said propylene copolymer has a heat of fusion of greater than 1.0 J/g to less than 75 J/g. 36. The process of claim 28 wherein said propylene copolymer has a heat of fusion of greater than 4.0 J/g to less than 30 J/g. 37. The process of claim 28 wherein said organometallic Group 4 transition metal compound comprises two cyclopentadienyl ligands covalently bridged by a substituted or unsubstituted carbon atom or a substituted or unsubstituted silicon atom, wherein said Group 4 transition metal compound is chiral. 38. The process of claim 37 wherein said Group 4 metal is hafnium. 39. The process of claim 37 wherein said bridge atom is substituted with at least one methyl group. 40. The process of claim 37 wherein said cyclopentadienyl ligands are indenyl. 42. The process of claim 28 wherein the aryl groups of said halogenated tetraaryl Group 13 anion comprise at least one fused polycyclic aromatic ring. 43. The process of claim 28 wherein the aryl groups of said halogenated tetraaryl Group 13 anion comprises at least one aromatic ring pendant in the 4 position to a phenyl ligand. 44. The process of claim 28 wherein said halogenated tetraaryl Group 13 anion is [tetrakis(perfluoro-4-biphenyl)borate]. 45. The process of claim 28 wherein said cocatalyst precursor compound comprises an essentially cationic complex selected from anilinium, ammonium, carbenium or silylium cationic complexes. b) recovering a propylene copolymer containing units derived from propylene in an amount greater than or equal to 75 weight percent, and units derived from ethylene in an amount of from 5 to 25 weight percent, wherein the copolymer has a melting point of from greater than 35° C. to less than 110° C., and a triad tacticity of greater than 85%. 47. The process of claim 46 wherein said propylene copolymer contains units derived from propylene in an amount of from 80 to 90 weight percent. 48. The process of claim 46 wherein said propylene copolymer contains units derived from ethylene in an amount of from 10 to 25 weight percent. 49. The process of claim 48 wherein said homogeneous polymerization conditions are adiabatically conducted in a continuous polymerization process. 50. The process of claim 46 wherein said homogeneous polymerization conditions are conducted in a continuous process at a pressure of at least 500 bar. 51. The process of claim 46 wherein the reaction temperature is in a range of 60° C. to 200° C.
52. The process of claim 46 wherein said propylene copolymer has a melting point of from less than 90° C. to greater than 40° C.
53. The process of claim 46 wherein said propylene copolymer has a heat of fusion of greater than 1.0 J/g to less than 75 J/g. 54. The process of claim 46 wherein said propylene copolymer has a heat of fusion of greater than 4.0 J/g to less than 30 J/g. 55. The process of claim 46 wherein said propylene copolymer has a a traid tacticity of greater than 90%. 56. The process of claim 46 wherein said organometallic Group 4 transition metal compound comprises two cyclopentadienyl ligands covalently bridged by a substituted or unsubstituted carbon atom or a substituted or unsubstituted silicon atom, wherein said Group 4 transition metal compound is chiral. 57. The process of claim 56 wherein said Group 4 metal is hafnium. 58. The process of claim 56 wherein said bridge atom is substituted with at least one methyl group. 59. The process of claim 56 wherein said cyclopentadienyl ligands are indenyl. 61. The process of claim 46 wherein the aryl groups of said halogenated tetraaryl Group 13 anion comprise at least one fused polycyclic aromatic ring. 62. The process of claim 46 wherein the aryl groups of said halogenated tetraaryl Group 13 anion comprises at least one aromatic ring pendant in the 4 position to a phenyl ligand. 63. The process of claim 46 wherein said halogenated tetraaryl Group 13 anion is [tetrakis(perfluoro-4-biphenyl)borate]. 64. The process of claim 46 wherein said cocatalyst precursor compound comprises an essentially cationic complex selected from anilinium, ammonium, carbenium or silylium cationic complexes. b) anions containing a single coordination complex of a charge-bearing boron or aluminum core wherein said core is tetra-aryl-substituted and each aryl substituent contains at least two cyclic aromatic rings. b) anions containing a single coordination complex of a charge-bearing boron or aluminum core wherein said core has three halogenated aryl-ligands, wherein each aryl substituent contains at least two cyclic aromatic rings, and one acetyl-aryl moiety ligand.